(NaturalNews) Following recent revelations of how Angelina Jolie's double mastectomy P.R. 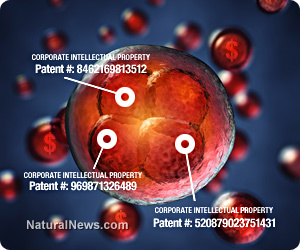 stunt feeds into the profits of the trillion dollar industry which claims to own human genes, Natural News is now calling on Jolie to publicly denounce patents on human genes, including the BRCA1 and BRCA2 genes she has now made famous. Does Angelina Jolie really stand up for women and human rights? Or is she a corporate sellout who corrals women into the for-profit cancer industry that claims ownership over the genetic code of all women? • The BRCA1 gene for breast cancer is patented by a corporation called Myriad Genetics. All patents are government-enforced monopolies over intellectual property, and they thus prevent anyone else from conducting research or testing on the BRCA1 gene without paying huge royalties to Myriad. This is why the BRCA detection tests cost $3,000 - $4,000 each. • Angelina Jolie's announcement of a double mastectomy even though she had no breast cancer caused the stock price of Myriad to skyrocket to a 52-week high. Whether she intended it or not, her advocacy of double mastectomies is causing market values to sharply rise in the human genomics industry, where corporations own patents on human genes. • Obamacare mandates that, over the next few years, taxpayers start paying for BRCA1 gene testing. This will be a direct transfer of money from taxpayers to the corporations that "own" the human genes being tested. • An imminent Supreme Court decision could make or break the human gene testing industry. Trillions of dollars are at stake. If the Supreme Court rules against corporate patents on human genes, BRCA1 testing will become amazingly affordable (in the $100 range), thereby denying billions of dollars in profits to gene patent holders. With all this in mind, we now ask Angelina Jolie: Will you now denounce corporate ownership over human genes? Monsanto is widely regarded as the "most evil corporation" on the planet. And why? Because it claims intellectual property ownership over the genetic code of seeds it sells to farmers. If Monsanto gets its ultimate wish, anyone who wants to grow food anywhere in the world will have to pay a royalty to Monsanto. Companies that "own" patents on human genes have a similar aim. They want every living human being to pay them royalties any time they run a test on a specific gene. In the same way that a farmer doesn't have the right to grow food without paying royalties to the corporations, anyone who wants to test their genetic code for possible risk factors for disease will be required to pay exorbitant, monopoly-priced royalties to the gene corporations. By nearly all standards of human rights, these practices are considered "evil." Patenting seeds and genes is a violation of nature, most people agree. The very idea of patenting a human gene is ludicrous from the outset. How can a corporation claim to have invented something that has already existed in the human genome for hundreds of thousands of years? The BRCA gene existed long before Myriad Genetics even came into existence. So how can Myriad "own" the BRCA genes? Hence the lunacy of the BRCA gene patents as well as Angelina Jolie's support of them. By terrifying women all across the country, Jolie is leading them straight into the hands of the for-profit cancer industry which already claims to own part of the genetic code of all women. This is a violation of nature. It is a violation of human rights, women's rights and reproductive rights. If Angelina Jolie really wants to prove she supports women, she must denounce corporate ownership of human genes. Failure to do that is nothing short of an open admission that she is working for corporate monopolists who seek to dominate women with intellectual property patents on human genes. There's no middle ground on this issue of corporations being granted patents over human genes. If you're against Monsanto, you're against corporations owning your genes, too. If you believe in human rights and women's reproductive rights, then you have to believe that your genetic code belongs to you and your children, not to a bunch of financial investors and corporate monopolists. Having children means replicating your genetic code, and the way today's patent laws are written, anyone who has a child with the BRCA gene mutation is technically in violation of U.S. patent laws and must pay a royalty to Myriad Genetics for each child born with the mutation. But you can't even find out if your child has the mutation unless you pay Myriad a huge fee just for the "right" to examine your own genes. That's a form of "genetic enslavement," and Angelina Jolie seems to be wholly supporting it. Remember: The patenting of human genes is a violation of nature and universal justice. No person is truly free if powerful, billion-dollar corporations can claim ownership over their genetic code. Yet Jolie has never spoken out against this exploitation of women. Will she now? I ask the question again: Is Angelina Jolie a corporate sellout, or a true humanitarian? Will she denounce the corporate ownership of human genes, or will she remain silent and continue to mislead women into unwittingly being victimized and exploited by for-profit corporations? Go to these Facebook pages and post the following question: Will you denounce corporate patents on human genes? Demand a straight answer from her on this issue: Is she a corporate sellout? Does she actually believe in women's reproductive rights, or is she really just an actor playing the role of someone who creates the illusion of caring about women's human rights? Is Angelina Jolie a corporate monopolistic sellout? • I am OPPOSED to corporations patenting food seeds and engineering GMOs. • I am OPPOSED to corporations patenting human genes. • I am OPPOSED to corporations patenting pharmacological medicines based on stealing molecules from nature (biopiracy). Is Angelina Jolie opposed to any of these? I think not. From what I can tell so far, she is a pro-GMO, pro-Monsanto, pro-monopoly, pro-patent, pro-Big Pharma, pro-corporation sellout. And this means she is anti-humanitarian, anti-women, anti-freedom, anti-open source, anti-family and anti-reproductive rights. If I'm wrong about any of this, let Angelina say so herself. Let her come out and admit in her own words what she really believes instead of hiding behind corporate P.R. spin and media propaganda campaigns that are obviously crafted and timed to manipulate public opinion. If Jolie actually comes out and denounces corporate ownership over human genes, and does so publicly and unambiguously in a large media outlet like the NYT, I will retract these articles and publicly applaud her for actually doing something courageous and meaningful. But don't hold your breath... there's virtually no chance Jolie actually believes in women's freedom, reproductive freedom and the sanctity of nature's seeds. Because Angelina Jolie is a fake. She's an actor performing a script, and the script is written entirely by business interests who seek to imprison and dominate all humans by exercising total control over their genetic code. Jolie is just their pretty-faced puppet, and the corporations are the ones pulling all the strings. Biotech companies could become real-life 'Body Snatchers' - are patents on people next?